Our goal during these sessions is to build on The Power Of We. Your team will be empowered with Navy SEALs Culture of Success, building on a deeper commitment and a greater sense of their personal brand. This event has been designed to capitalize on the ever‐complex battle‐space in today’s business environment, where increased focus is placed on fully utilizing and leveraging the value of employees. Showing strong team leadership is the answer to increasing productivity, reducing turnover and boosting morale. Humility is par for the course and elitism is the tipping pot for failure. 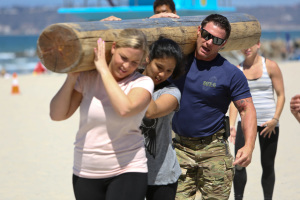 Our approach to team building is in concert with the US Navy SEALs, where powerful leadership and effective teamwork are more than just concepts, they are necessities. Team building breakout sessions, presentation begins with the foundation of the company in which we openly discuss Commander’s Intent, Mission Statement, the Vision of the company and what it means. As well as having each person understand the culture and climate of their organization. Areas of focus include Commander’s Intent, Communication, Expectations, Front Site Focus and Value vs. Results. This is a team building event and Full Mission Profile (FMP), where each member of the team is tasked with completing the mission. The mission encompasses the areas of focus from the presentations; each member will be presented with options and challenges. These options and challenges are physical, but logic based. It is the goal that the teams take home the understanding the value and commitment of each member of the team and expectations within any given crisis. Areas of focus include Communication, Contingency Planning and Teamwork. Contact us for more information regarding how SOT-G can help with your groups team building needs at the bottom of this page.